Next Tots & Cargobikes session is on Weds 17 May! Join us for fun in Victoria Park on Wednesday 17 April between 1:30pm - 3pm ! Meet by the playground opposite the Royal Inn On The Park, E9 7HJ, drop-in between those times, it's FREE and you don't need *any* of your own equipment! You don't even need a bike. 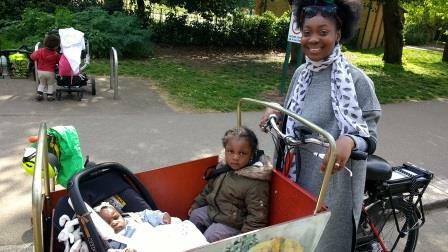 Just bring yourself and your babies/toddlers and have some gentle exercise in the park with us. Also check out our Facebook events page!